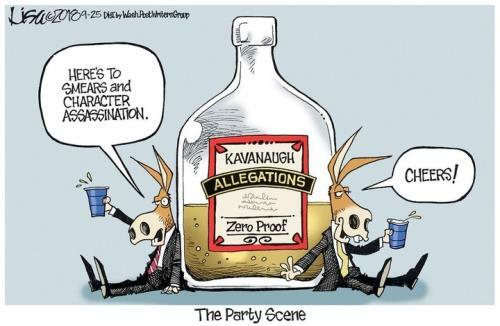 Listening to the bloviating Dems this morning one could conclude they’d all been on a bender since this process began months ago. They still insist they haven’t been given the time to investigate thoroughly. This entry was posted in Art, politics. Bookmark the permalink. Today’s batch of BS from the Despicable Demwits on the Judiciary Committee was designed to CYA – and Sweinstein’s – for the way Ford’s allegations was handled. Didn’t work, and their “A” is still out there for all to see. So they bloviated and then walked out. As I understand Senate rules, you cannot vote unless present. So go ahead, Mr. Grassley. Call the vote and get Kavanaugh recommended with zero Demwit votes! This is perfect! Flake flakes on the side of Christine Blasey Ford and this is what he gets from left-think women (aka Lippy Loons)! Oops, my error. This took place before the hearing. Nevertheless, it is ironic and the women are Lippy Loons. Feinstein should be brought up on ethics charges for holding onto Ford’s letter and not bringing to Grassley and the committee. Off topic, but great news. “A judge on Thursday ruled California’s sanctuary law tramples on the state’s charter cities, dealing a major blow to the state Democratic establishment’s anti-Trump policy. No one says it better than Senator Kennedy. Love this guy! Wrong, Senator. There is no bottom to the vileness of the Democratic Party. Standard issue in the Rat’s army is an entrenching tool. And in the coming Despicable Demwits will all be nominated for sainthood by their partners-in-crime – the Lunatic Leftie media presstitutes.